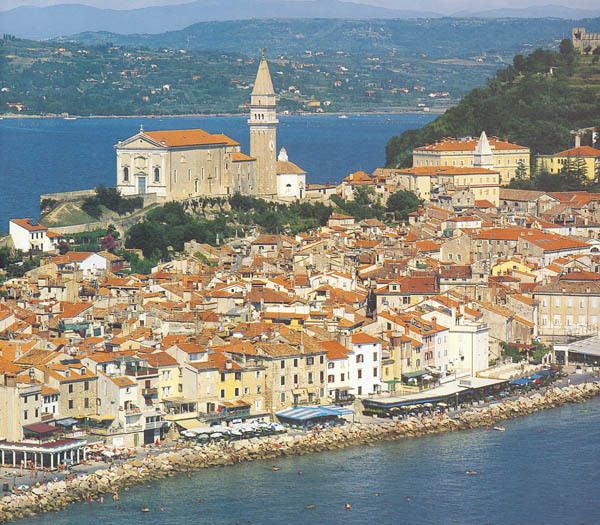 This picturesque maritime town is situated on the westernmost spit of land in Slovene Istria. 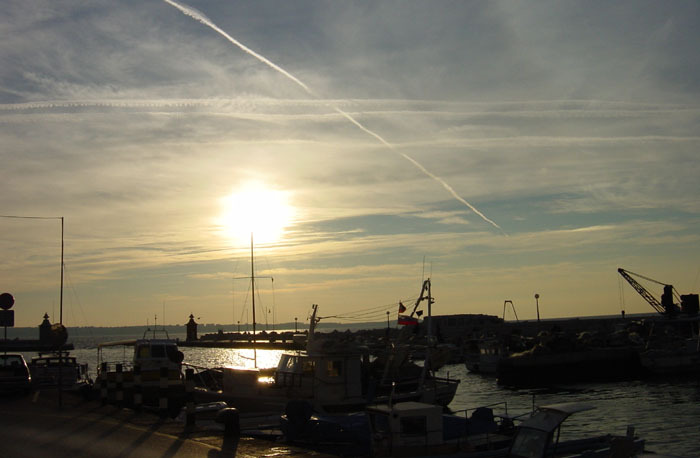 Piran is a centre of naval affairs, of fishing, cultural activities and recreation. 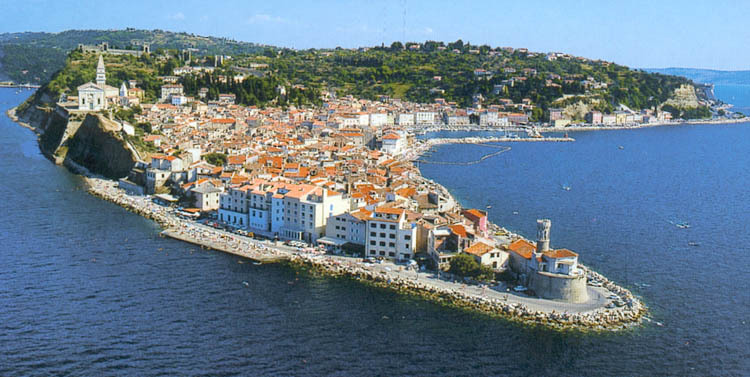 As all seaboard places, Piran enjoys a pleasant mediterranean climate with hot summers (in July, the average temperature is 23.2 C. (74 F.) and bland winters (in January, on the average, 5.7 C. (42 F.). The lush Mediterranean flora with cypresses, figs, kbaii-trees (Diospyros khakil, olives, stone-pines, medlars etc., and a typical Mediterranean architecture beautify the surroundings of Piran. In summer thousands of guests enjoy the brilliant sunshine and the wann sea. Piran is an excellent seaside resort. 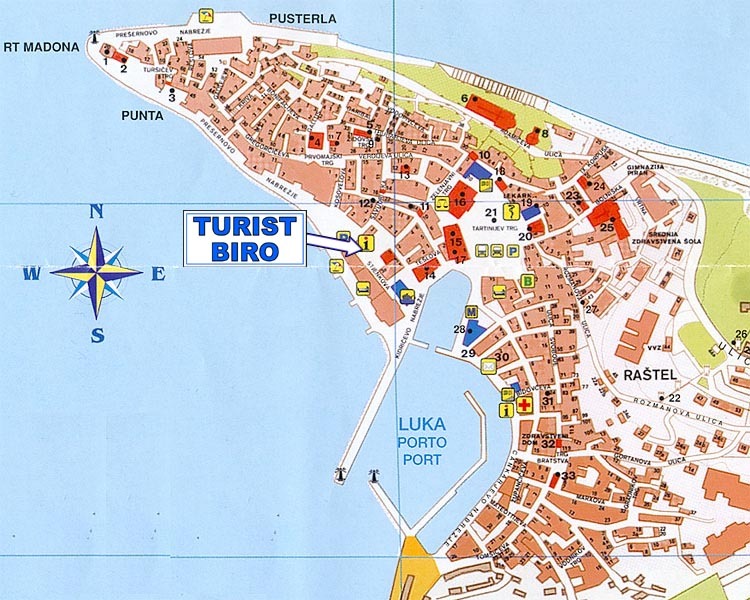 The township of Piran was has been founded in as early as the mid fifth century A.D. In the 13th century, it fell to Ventets and entered in a flowering period. The saltworlds of Strunjan, Lucija and Secovlje were founded. Merchants, artisans and saltworkers built numerous houses, which in their narrow alleys still illustrate the architectural styles of many an epoch. At present, Piran is a historic town abounding in sights. The present inhabitants have decided to maintain their town forever in its historic shape. Our foreign visitors like the impressive atmosphere of the old town with its adorned front-doors and windows. In the middle of the town is Tartini Square with the monument to the great violinist and composer Giuseppe Tartini, born in Piran in 1692. Worth seeing are also the town hall and the law-court, the Gothic ''Venetian mansion, the cathedral on an eminence, commanding a glorious panorama; in the church there are paintings by authors from the Venetian scool, the slender campanile is a copy of that beside St Mark's in Venice. The citywall from the 15th century bears powerful guard towers. The lighthouse on the Punta (spit) is built in Moorish style. The municipal archives belong to the richest such collections in the country and boast precious records and documents from the 12th century on. The municipal museum contains valuable archaeological, ethnographic, historical and artistic exhibits. Moreover, there are: an aquarium, the Tarlini Theatre, and the Gallery of Art.